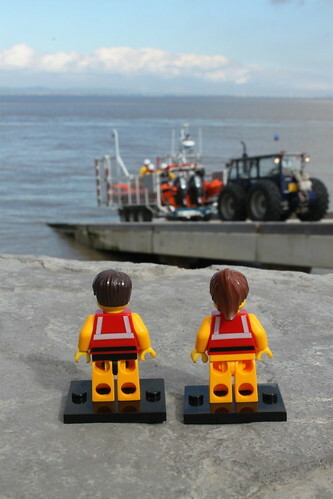 Last Sunday was a big day for the RNLI lifeboat station at Portishead. 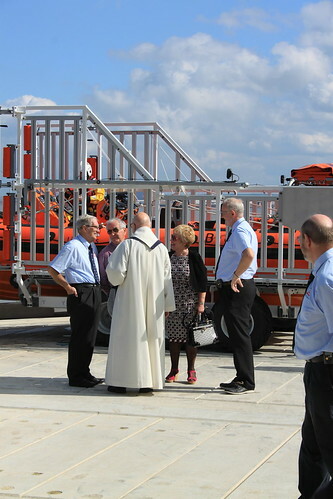 Because it was time to dedicate and bless the station’s brand new Atlantic 85 lifeboat ‘My Lady Anne’. And there was no way that the little guys were going to miss this. ‘My Lady Anne’ had arrived on station at the beginning of the previous week and the (regular sized) crew had spent an intense few days getting to know her and learning about the new equipment on board. * Because while she is similar to the station’s existing Atlantic 75 lifeboat ‘Spirit of Clovelly’, there are a few important differences. Firstly, and perhaps most obviously, the new boat is just over a metre longer than the old one and can take an extra crew member. Less obviously, she has a stronger carbon fibre and foam core laminate hull, which makes her stronger. She has more powerful engines, too, which make her a little faster. And anyone who’s paying attention will see that ‘My Lady Anne’ comes complete with her own radar set – invaluable when working in poor visibility. 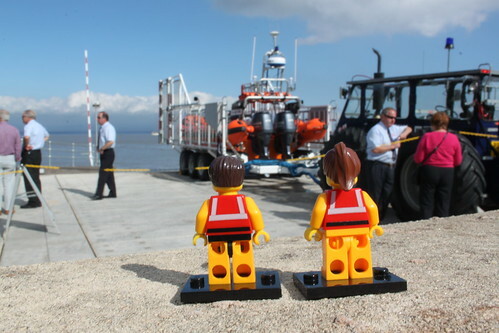 By the time the little guys arrived at the station, the new boat was already poised at the top of the slipway and looking resplendent in the sunshine. The station’s crew and other personnel were also starting to gather, the crew looking particularly smart in their shirts and ties. It soon became apparent, though, that there might be a launch and demonstration of the new boat on the cards. Or someone didn’t get the memo about the dress code. 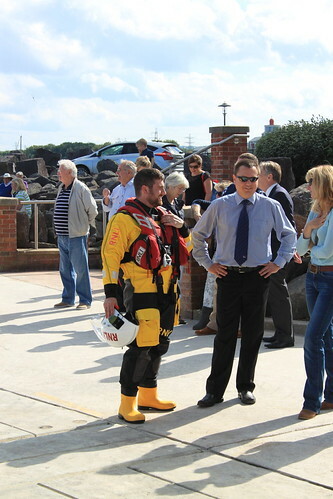 The station’s chaplain was on hand to bless and dedicate the boat. 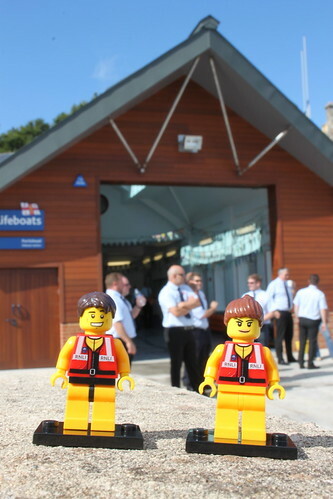 The station was also delighted to welcome Bill Wraith, whose generous donation helped to fund the lifeboat, which is named in memory of his late wife. Once the short ceremony – which included the now-traditional pouring of cider over the bow of the boat – was over, the crew leapt on board and everyone got ready for the launch. The little guys made sure that they had a good view. 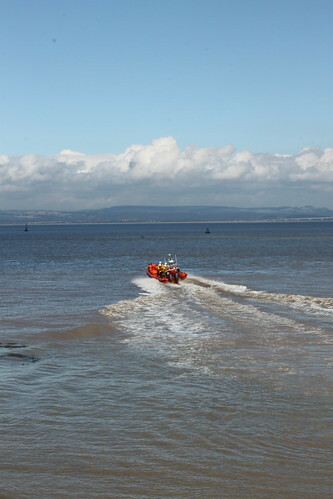 Within seconds, ‘My Lady Anne’ was down the slipway and approaching the waters of the Bristol Channel. 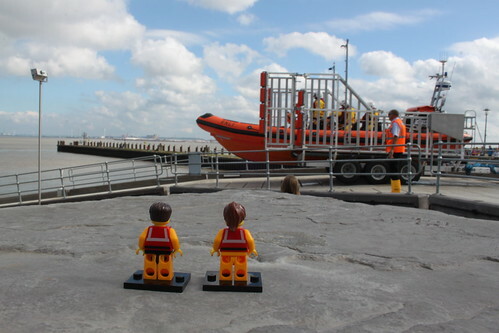 The little guys, and everyone else, enjoyed a fantastic display of the boat’s – and the crew’s – capabilities. She certainly wowed the crowd with her manoeuvrability and startling turn of speed. So while the station has had to hand the ‘Spirit of Clovelly’ back to RNLI HQ, there’s no doubt that ‘My Lady Anne’ is a worthy successor. And everyone at the station – indeed, everyone in the town – is proud to have her as part of the team. 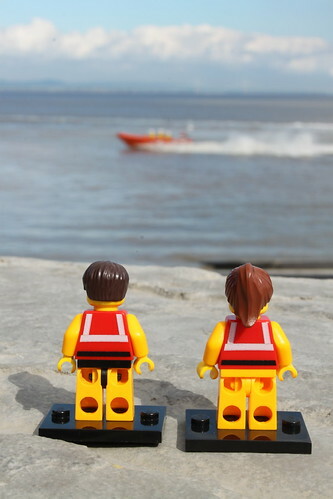 This entry was posted in Out and about and tagged Lifeboats, Portishead, RNLI, The Lifeboat Crew by Simon Perks. Bookmark the permalink.